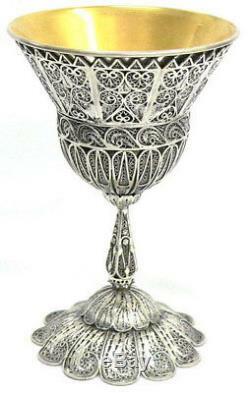 Sterling Silver Shabat Kiddush Goblet - Wine Cup, Jewish Yemeni Filigree Style. Brand New, Made in Israel. 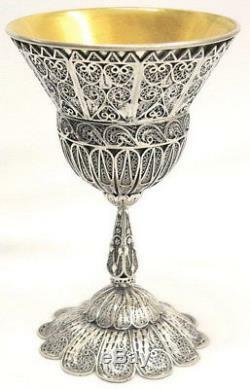 Magnificent sterling silver shabbat Kiddush goblet /cup , made in Israel. Designed in old Jewish yemenite filigree style. Rich with intricate ornaments of interlaced silver wires that forms hearts filled with spiraled shapes. The inner side of the cup is 14K gold plated. A true delight for the eyes, Lovely for display in any collection. 5.1 x 3.3 inch / 13 x 8.5 cm. 6.7 ounce / 190 gram. The Jewish Yemenite Filigree Art was developed by Jewish silver and gold smiths in ancient. And is related to Judaism and Judaica, being used particulary for religious holy occasions like marriage, engagemaent and more. This technique was commonly practiced in. And in the art school BEZALEL located in. Today very few craftsmen are practicing this wonderful skill, most of them passed away or moved to practice a more modern line of work, therefore real handmade filigree items are fairly hard to find. Find a special gift Unique art works & gifts, handmade by Israeli artists Vintage antiques & collectibles from the early days of Israel. We are a small team dedicated to your service and always want to make sure that you are happy. If you're not satisfied - we're not satisfied. All orders are insured for loss or damage. Wrapping and packing are done with great care, to ensure safe arrival of the goods. We appreciate your help and patience. When contacting us please mark "I have a question about item". If you need more time please let us know in advance. Similar spelling: Chanuka Jewish Festival Holiday Filigrane filigee filigrana filigran filigrann grain granulation lacework yemen yemenite judaica judaika Israel Judaica Kreisel draydl dreidlel kreisel Judaism Art Israeli Artists hand made handcrafted designer Artisan hanukkah Lamp Hanukkah Kreisel top dreidel, Sevivon Dreidel Hanukka gift, present, , festival, Hanouka, chanukah Chanukka Menorah Artistic candleholder Candelabra Candelabrum Holy Jewish Temple in Jerusalem Beit Ha-Mikdash, Mered Hachashmonaim Maccabees Matityahu, Yehuda Maccabi olive oil jar Pitcher Antique Menora chanukkah hanuka Hanukah Hanoukka Lichterfest hanouca Greekshanoucca candlestick hanukkiya hanukkiyah Hanukiya, Greeks Syrians Greco-Romans Antiochus Menorah Hanerot Halalu Kodesh Hem Hanukkah Miracle Nes Pach Hashemen. 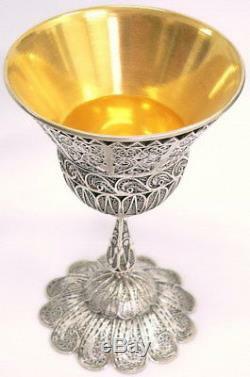 The item "Shabbat Wine Cup Kiddush Goblet Yemenite Filigree -Sterling Silver Judaica Art" is in sale since Thursday, March 17, 2011. This item is in the category "Collectibles\Religion & Spirituality\Judaism\Cups & Plates". The seller is "artfromisrael" and is located in Thank you for looking. This item can be shipped worldwide.